Everyone loves a good secret because who doesn’t want to know the what’s going on? I know that I am always looking for good advice on life, love and everything in between. Being a military spouse means there will be times you need advice or need a secret or two to help you on your way. I want to share some secrets with you. Most often we go about our lives and forget what matters. We may even forget there is a path we can take with the least resistance. When it comes to being a spouse especially being a military spouse being able to be adjust to things, people or places is a must. Whether your spouse is on a training or mission and deployed your spouse is under a tremendous amount of pressure on a daily basis. Try to put yourself in their shoes. Realize that something’s are a part of the job and not a reflection of your spouse. Forgiveness in any relationship is a must. It can be hard to forgive or admit that you were wrong. Keep in mind, forgiveness helps you and your spouse to move on from the situation to a more balanced emotional state of mind. No one is perfect and forgiveness is even more important in a military relationship. Forgiveness is twofold first you are able to let go of negative feelings and second you are able to grow and learn within your relationship. Communication expressing yourself through talking to your spouse, but also the way you talk to your spouse. I know I have been guilty of using a bitchy tone with my wife. It doesn’t help us connect or feel close to each other. Tone matters when you are speaking or expressing yourself to your spouse. Words and how you say them are powerful and so are emotions. Find the balance in how you communicate with your spouse. I believe being understanding means being able to know when your spouse is tired or happy or hangry. Understanding mean putting yourself in your spouses shoes. It also means realizing not everything your spouse says or does is personal. I think being able to be understanding gives you the edge to see the situation through your spouses eyes instead of just your own. Yes, at times it can be hard to see it their way but of course everyone has and opinion and different thoughts about things. Keep your heart open and listen to your spouse a little more. There is a lot to be said about simply being kind to your spouse. Maybe they missed your call or your spouse hasn’t emailed or written back to you as quickly as you would like. When you do get a chance to talk with your spouse be kind. Its all about the approach you take to get the response you need. Kindness is the act of being considerate of the other person’s feeling while being generous in the manner in which you interact. Being kind can go a long way when it comes to the interactions you have with your spouse and can help eliminated future arguments. You can be kind it just takes a second to practice. When in a military relationship, you have to remember if you spouse comes home grumpy and doesn’t want to talk about work that day is okay. Recently, my wife came home and was frustrated about her rank in time and the promotion she was suppose to receive. however once her unit looked into her service everything worked out. If you are in a situation where you can seem to connect with your spouse give your spouse space, time and opportunities to talk on their own about what happened in their day. In military life might more often than you would chose to or switch jobs more frequency than you might like. Military life is full of surprises, opportunity and you learn how strong you are as a person. Its important to be positive in any new atmosphere you are in. Look at your cup as half full instead of half empty. There are gonna be time when you need someone other than your spouse or family to confide in. Be open to new coworker or other spouses where ever you are stationed. Look for ways to connect with your community like participating in local charities or food drive or check out a FRG meeting. Military life is daunting, its okay to ask questions or talk to others if you are frustrated or upset or just plain happy. There will be times you need to confide in others like friends, acquaintances or co-workers about what’s going on in your life. Take a good look around and see what you need help with. The only dumb question is the one you don’t ask. I really love knowing everything. I also ask or research and try and find the answer. Remember its okay to be alone, but try to find ways to beat loneliness while your spouse serving their country. Let go of unattainable or unrealistic ideas of what it means to be alone. Take the time when your spouse is away to discover who you are, what you want out of life, and spend time with friends and family. Why not do all those things you have been meaning to do? And I don’t mean cleaning. Be who you are, do what you enjoy. Don’t lose sight of what make you happy and what makes you passionate. I love reading. (Harry Potter is awesome just saying) I love cutting hair and I love working. My family and friends are important to me and I enjoy spending quality time with them. Being able to be your true self means not letting your circumstance cloud what makes you happy and makes you who you are. Focus on taking care of yourself because no one else will. Be healthy from the inside out. Learn to eat better, sleep well, stress less and find peace. Military life can throw you a bunch of curve balls and you need to be emotionally and physically fit to hand all the stresses that can come your way. Exercise in whatever way make you feel good about yourself whether that is by doing yoga, running at the gym or just going out into nature and walking. Always find a way to see the good in all things. 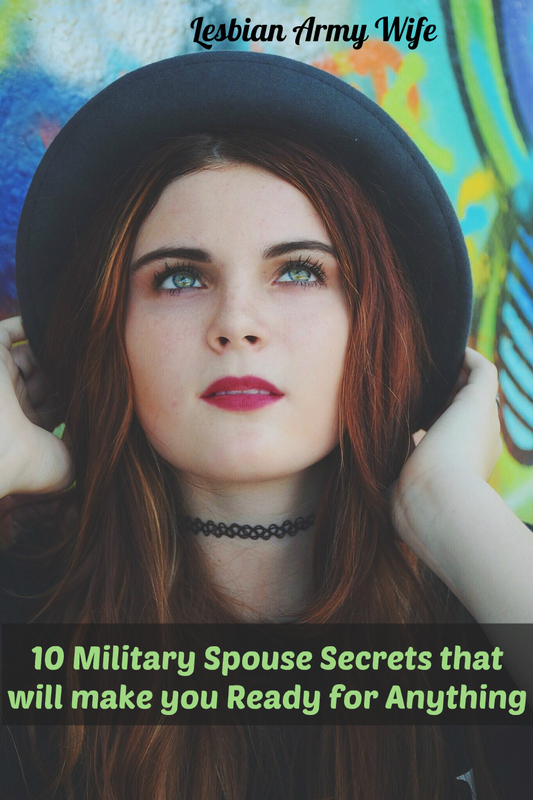 What secrets do you have to share with other military spouses? Leave a comment!